Without fail, every week I say to someone in my office, “if they had only had a simple will.” Tragically, when a loved one dies without a will, the task of closing that person’s business is a nightmare at best because it just became more costly, time consuming and difficult! Because everything that happens in my office is confidential, I cannot share with you the horror stories that I encounter weekly; therefore, as an example, I will tell you my story. When my father died in 1967 without a will, my mother had not worked in 22 years and she had no skills. We had no savings, no income and a monthly mortgage that we could not pay. When Mom went to the bank to withdraw money to pay for the funeral, the bank froze the account until she brought in the proper paperwork. We had inherited a little house in Oklahoma from Dad’s mother, who also died without a will, but that mortgage was paid off years before. Within the month, Mom made the decision to sell our home and move to Oklahoma, but we hit a hiccup. I was just 11 years old and the title company would not allow us to sell the house until I reached the age of 18 without court approval. Mom did not want to do the court route, nor did she have the money to do the expensive attorney process, so we postponed the move. The next trouble came when mom tried to sell the old car for a more reliable one; the old car was in Dad’s name! She did not have the authority to make the transaction. Finally, she called an attorney. If Dad had only had a simple will, life would have been so much easier for the Hastings family. Instead, Mom was required by the court to pay for and post a bond that would remain in place until I was 18. She had to receive permission from the court every time we wanted to sell or buy a car or anything of value. Why did this all happen? Because I was under age! I had inherited part of the house and the car but I could not legally sign the documents to sell them. The law and the judge were in charge of my part of the property and Mom had to prove that what she was doing was for my best interest in the long run. Just imagine: my mother had to ask the judge for permission to do what was best for me. If Dad had only had a simple will leaving everything to Mom, none of this would have happened. On my 18th birthday, I visited an attorney’s office and signed everything that was mine at Dad’s death to Mom. It truly was a seven-year ordeal that could have been avoided with a simple will. 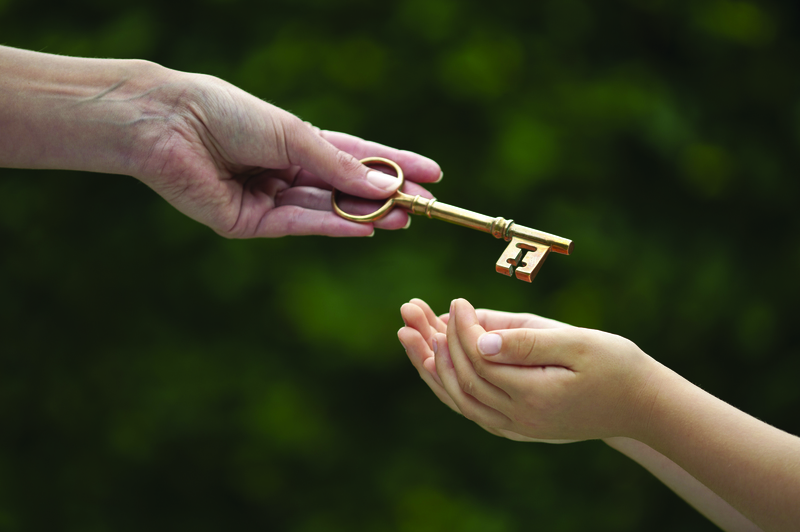 Everyone, 18 years of age and older, needs a simple will. The will tells everyone involved how to dispose of your possessions when you die. Who gets your car! Who gets the money in your checking account! Who gets your clothing and jewelry and anything else you own. But let me finish my story! Remember, I mentioned that we had inherited Grandmother’s house, but she, too, had died without a will in 1961. Forty-one years later, in 2002, I decided I needed to get rid of that house in Oklahoma. Legally, it was mine, but I did not have the authority to sell it. I had to hire an attorney and prove to the court that my dad was the sole legal heir to the house. Then I had to do a second filing to prove that Mom was the legal heir to Dad’s estate, and I had to prove that I had legally signed everything over to Mom. Then, in a third filing, I had to probate Mom’s will in Oklahoma to bring the property down to me. The whole process cost more than the sale of the house, but it was the only way to get rid of the property. If Grandmother and Dad had only had a simple will, how easy it could have been! What is my point? The staff of Sagemont Church hears these kinds of stories every week, and it is always too late when the loved one has passed away. Therefore, we want to make it so easy and affordable for you to obtain a simple will that you have absolutely NO EXCUSE for not having one. Along with several of the attorneys who are members of Sagemont, we want to offer to you a simple will at no charge. To get in on this project, you must live in Texas, attend Sagemont Church, and come to an introductory meeting on Sunday evening, April 13, 2014 at 6:00 PM in our Worship Center. Dr. John Morgan will be there to lead the evening with others helping in the presentation. At that time, we will help you understand how to fill out a short data sheet that will give us all the information needed to provide you with a simple will. We will also schedule you for an appointment to return to sign and have your will notarized. You will then take your will and put it in safekeeping; we will not keep a copy of your will at the church. It is that easy and you really have no excuse. I truly hope that you will take full advantage of this gift from Sagemont to you and your family and future generations.